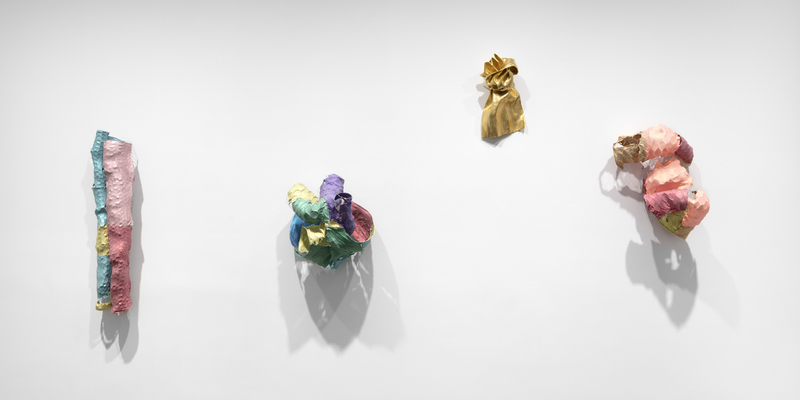 View of “Lynda Benglis,” 2018, Paula Cooper Gallery, New York. © Lynda Benglis/Licensed by VAGA, New York, NY. WHEN I MOVED TO NEW YORK IN 1964, there were race riots going on in Harlem. I attended the Brooklyn Museum Art School, and there I met a Scotsman named Gordon Hart. We both had arrived at the school at the same time, and he knew the goings-on about town. Right away the art world just opened up, and it wasn’t like there were huge lines of people at the openings. There were actually few people. There was also Max’s Kansas City, where we all hung out at the bar and began to talk. There were people I knew going every night, and that was where you’d hear the gossip about who was in a fight and who threw drinks on somebody—that silly stuff. I remember going there and seeing Carl Andre or Brice Marden. It felt like the only place where you could meet other artists in the evening. And usually it was the artists who closed the place down, early in the morning. The liquor flowed, and people were always drunk—they stayed so long that by the time they left they had eaten two or three meals, and they were just sober enough to get home. I was also taking dance classes near the Park Place Gallery at that time. Paula Cooper was directing the gallery, and it was there that I saw Brice’s paintings for the first time. There were so many excellent shows there. In 1968, Paula opened her own place—the first gallery in SoHo. The thrilling thing was that Paula was showing new works and knew all the artists personally, which was unusual at the time. In 1974, when I took out my scandalous advertisement in Artforum, Paula was incredibly supportive. The editors wanted the name of the gallery to be on the ad. So we put it there in very small print on the top of the page. It was all very shocking in terms of the inner workings of the magazine, but in the end, I think the ad received the kind of attention that it deserved. I had previously begun working for Paula part-time and was showing my work with her as well. One day in 1970, Clement Greenberg came to my first solo show and walked around my sculpture made in situ (looking dumbfounded). I happened to be sitting behind Paula’s desk watching him. He stopped and scratched his head, then left in the elevator opposite me. I was so delighted that it confounded him because it was doing everything that I had heard he was suggesting to other painters that they do, such as turn their work upside down or present it on the floor.